Difficulty concentrating can come on strong and out of nowhere during menopause. Everyone gets distracted or day-dreamy at times, but throughout this transition it can be ongoing, disruptive, and troubling. 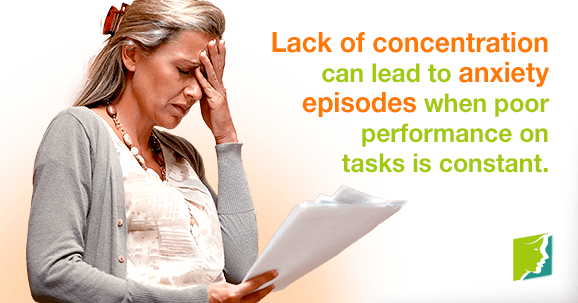 The lack of focus is likely due to hormonal fluctuations. The decrease in estrogen, in particular, can disrupt cognitive function and make it very difficult to go about your personal and professional life in a productive way. Although this can escalate to stress and even panic, there are healthy remedies for relief. First, it is important to understand what exactly difficulty concentrating entails. This ongoing mental fog requires you to exercise much more brain power to complete tasks, making you exhausted by the end of the day. You can become confused by the simplest and most mundane tasks, like what to buy at the store or where you put your car keys. It can become increasingly difficult to perform complex tasks at work, due to forgetfulness. Despite your best efforts, memory lapses can become obvious when you lose your train of thought during conversations. At first, you may forgive yourself for the daydreams and general disorientation. It can even be liberating and help you exercise your imagination. However, when you start to realize how long it has been going on, it can become troubling, embarrassing, and disruptive. This is when your thoughts take a turn - they start to become worries. Amid all the cognitive fuzziness are waves of paranoia. The nerves can build up and actually make you feel panicky about all the responsibilities and conversations you're confronted with. You may also start to become terrified that you are becoming senile or developing Alzheimer's. Getting the right nutrients, such as B vitamins and omega-3 and 6, will help improve cognitive functions, which will improve concentration. Eating a balanced diet of whole grains, fruits, colorful veggies, and proteins (such as tofu) will boost your brain power, as well. Reducing your intake of sugar, caffeine, and alcohol is also recommended in curbing your inability to concentrate, as well as anxiety episodes. Nothing will put you in a stressful mentality more than a sedentary lifestyle. Instead of watching T.V. or going on the computer, try going for a jog or even taking a walk in the park. Around 2.5 hours of physical activity weekly will clear up your mind. Also, try to incorporate 15 minutes of meditation into your daily routine to help release negative thought patterns. The versatility in the medicinal functions of herbs is truly amazing for every aspect of this issue. Phytoestrogenic supplements, such as black cohosh, mimic estrogen, which can help naturally ease hormonal fluctuations. Taking gingko supplements, for example, can improve focus and mental clarity. To de-stress, kava can help you feel calm and clearheaded. If you notice your inability to concentrate escalating, do not let it get the best of you. Just take a breath, assure yourself that you will be alright, and know there are measures you can take to help ease your anxiety. Making one or more of the adjustments mentioned can provide lasting relief to your body and mind and have you performing at your full potential.